Welcome to the worlds greatest guide to Women's Business Shirts. Are you actually looking for ladies business tops? We certainly hope that you are because the reality is you have fortunately found our women's business blouse page. 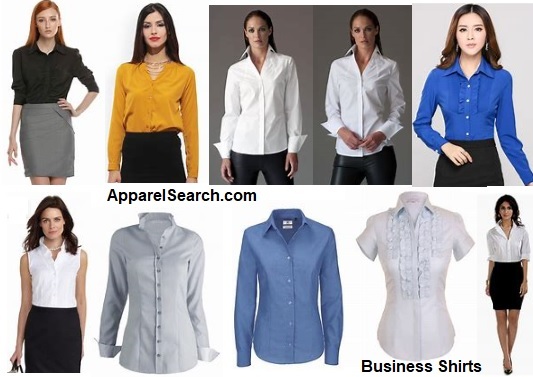 In this women's clothing section of the Apparel Search directory, you will find all sorts of interesting information regarding women's business shirts. Dress to impress. Are you looking for dressy tops for women? International business attire has progressed over the years. Different countries, cultures, and companies treat the dress code differently. Traditionally the majority of work places had standardized dress codes for all employees. The typical choices consisted of conservative colors, fabrics, and styles. At some companies and industries the traditional method holds true today. However, at other companies the dress code has relaxed over the years. If you are not certain regarding what is appropriate for your place of work, you should consult with your human resources department to find out if they have a formal dress code. When in doubt, we suggest you dress "conservatively". Business is the activity of making one's living or making money by producing or buying and selling goods or services. It does not necessarily mean it is a company, a corporation, partnership, or have any such formal organization, but it can range from a street peddler to a large banking institution. When we refer to business tops, we are referring to blouses worn in a more corporate environment. Although a sports bra is an appropriate top for a yoga studio business, that is not the type of business top we are referencing on this page. Simply put a business shirt is blouse or top that is appropriate for a corporate setting. The word blouse most commonly refers to a girl's or woman's dress shirt. A dress shirt, button shirt, button-front, button-front shirt, or button-up shirt is a garment with a collar and a full-length opening at the front, which is fastened using buttons or shirt studs. A button-down or button-up shirt is a dress shirt which has a button-down collar – a collar having the ends fastened to the shirt with buttons. Women and girls often wore blouses. Experience exceptional form and function with stylish designs of women's dress shirts. If you take the time to shop, you are sure to find fabulous business tops for your wardrobe. Business casual is an ambiguously defined dress code that has been adopted by many professional and white-collar workplaces in Western countries. It entails neat yet casual attire and is generally more casual than informal attire but more formal than casual or smart casual attire. Smart casual is an ambiguously-defined dress code that is generally a neat yet casual attire. The informal attire is most commonly used for business events and meetings, job interviews, or in professions like law and finance. It is a conservative dress code that aims to show respect to the situation and not draw attention. Semi-formal is a grouping of dress codes indicating the sort of clothes worn to events with a level of protocol between informal (e.g., lounge suit) and formal. In the modern era, a cocktail dress or little black dress is customary for women. Apparel Search is a leading guide to fashion, style, clothing, glam and all things relevant to apparel. We hope that you find this women's dress blouse page to be helpful. What ever type of work attire you are wearing today is in fashion. If you want to be even more stylish, you should wear your Women's Business Shirts. You may find the following clothing category directory pages to be of interest so that you can further research interesting types of clothes. Learn about dress shirts in our fashion influence section. Clearly and important product for business professionals. If you are interested, you can also review different shirt styles in our terminology section.